When it comes to the tire-shredding products of Mercedes-Benz’s in-house tuner, AMG, it’s best not to ask “why?” At AMG every car, from the C-Class sedan to the M-Class crossover, is fair game. Proof of that insane mentality is the latest tuned G-Class, the G65 AMG. It’s a vehicle designed for military duty, and now it packs a V12 punch. A source close to Mercedes told Auto Evolution that the G-Class will get a 6.0-liter V12, the same engine used in the S-Class sedan, CL-Class coupe, and SL-Class roadster. In those fine automobiles, the engine makes 612 horsepower and 738 pound-feet of torque. The V12 is usually coupled to a five-speed automatic transmission, but the G65 AMG will get AMG’s Speedshift Plus 7G Tronic, a seven-speed transmission that was previously considered too weak to handle the V12’s immense torque. There is no word on any modifications to the car’s suspension or brakes; it will be interesting to see whether AMG tunes the G-Class primarily for on-road or off-road driving. Judging by the above spy shot, it seems like the G65 AMG will get some cosmetic additions to differentiate it from lesser models. The covered front bumper points to a modified front air dam, and the wheels and tires look more aggressive than the stock G-Class’. Any car with 612 hp is pretty crazy, but the G65 AMG is especially so. It was originally developed as a military vehicle, and is still used by armies around the world. Known to fans as the “G-Wagen,” it went on sale in 1979, giving it the longest production run of any Mercedes. A high-performance car based on a 30-year-old army truck seems a bit odd, but AMG has been refining this concept for a few years. 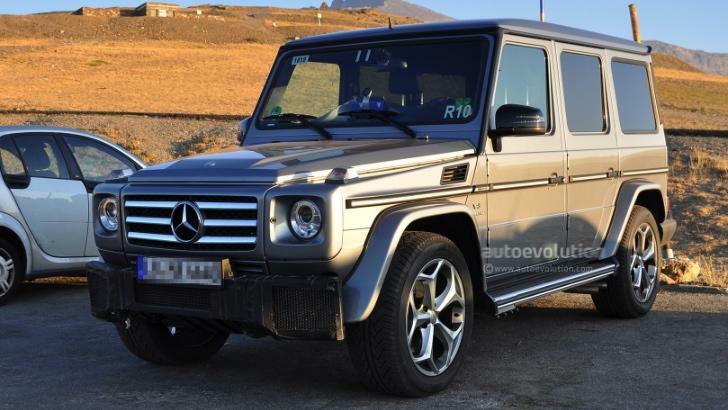 The first G55 AMG debuted in 2001 with a 5.4-liter supercharged V8, and the G65 will actually be the second super G-Wagen in Mercedes showrooms. AMG will also build a G63, powered by a 5.5-liter, twin-turbocharged V8 with 536 horsepower. Hopefully, it will cost less than the G65, which will ring in at an estimated $290.000. What will the G65 compete against? Lamborghini built a military off-roader with a V12, the LM002, but that was way back in the crazy ‘70s. The Porsche Cayenne and Range Rover Sport claim to offer on-road performance combined with off-road prowess, but the G65’s V12 and military pedigree put it on a completely different plain. The same question was posed to Ford’ Special Vehicle Team when it replaced the rear-wheel-drive F-150 Lightning pickup with the 4×4, off-road-ready, Raptor. It’s hard to think of an answer, but the Raptor is still an amazing truck. The G65 AMG will probably be the same. Sometimes, it’s best not to ask why.